Canada: We are preparing to launch in Vancouver where Kinsight (http://kinsight.org) has confirmed launch of the full Now and Next suite of programs over the next 2 years, following enthusiastic endorsement from their 30 practitioners trained in Pictability in June. Well, 2018 has been filled with new breakthroughs. These are posted on our Now and Next Alumni blog here. 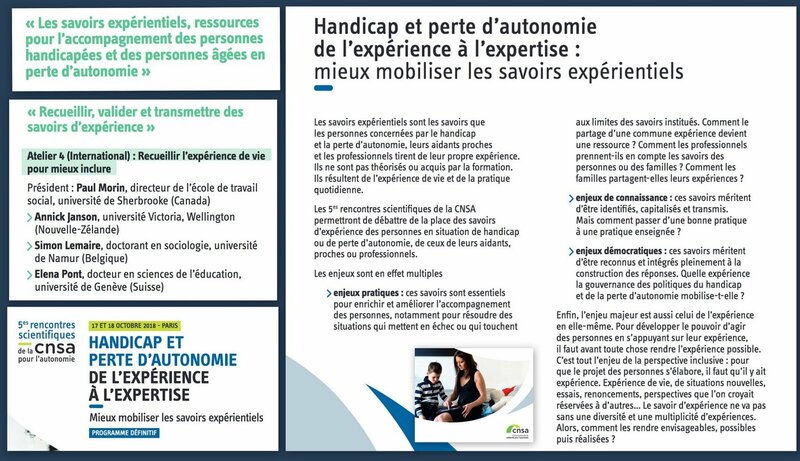 For now, Annick is heading to Paris where she will share with an audience of practitioners, and people with disability and their families and carers what we have learnt about the value of experiential knowledge through our Pictability tool. 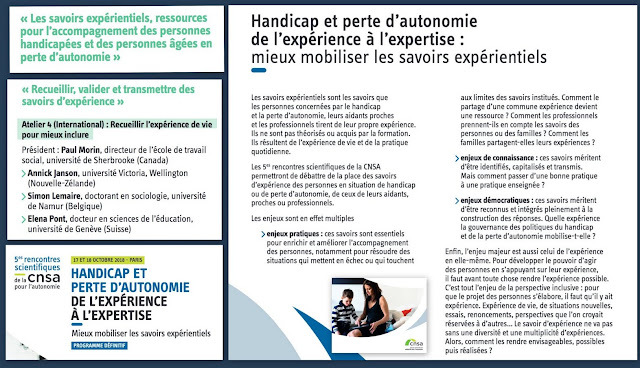 The organising body is the CNS (Caisse Nationale de Solidarite pour l'Autonomie) and the full pre-program of the 5emes Rencontres Scientifiques de la CNS can be viewed here. The time when parents receive a disability or developmental delay diagnosis for their child can be emotionally confronting for families, raising questions about the value of planning at this moment. The paradox, however, is that service providers need to produce a plan in order to access funding. An Australian-New Zealand group tackled this issue, proposing a radical new approach to planning. Launched in 2015 by two professionals with lived experience (Mahmic and Janson, 2018), PictabilityTM a novel practical planning tool was co-designed with the 300 families that have since used it to create change for their children. This tool allows for a visioning experience, which embeds parents’ prospective lived experience into a creative and fun planning process. Parents described the resulting plans as inspiring them into action, and reported that using this tool has helped them move away from a deficit to a strength-based approach. This application pioneers the implementation of Positive Psychology in the disability sector, in particular Seligman et al. 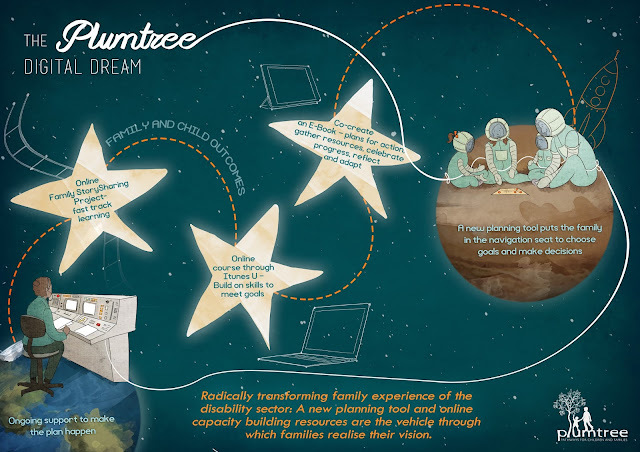 (2016) concept of ‘prospection’ where families explore their futures with hope. Trained peer parents support participants to identify and draw on their inner strengths to formulate their inspirational goals for their family, child and their personal development. · Reporting on participants’ empowerment, agency and wellbeing gains through robust measurements. Families recognize their accountability in building their capacity as the missing link in their partnerships with professionals, so they choose the specific pathways that match their strengths. 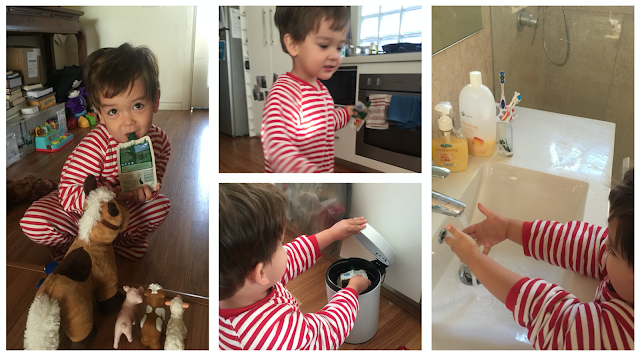 In these parents’ view, leadership is not an option – it is their responsibility. A comprehensive research framework accompanies implementation to add the family voice as crucial evidence (“what works”), largely been missing in the body of literature about professional-family partnerships. 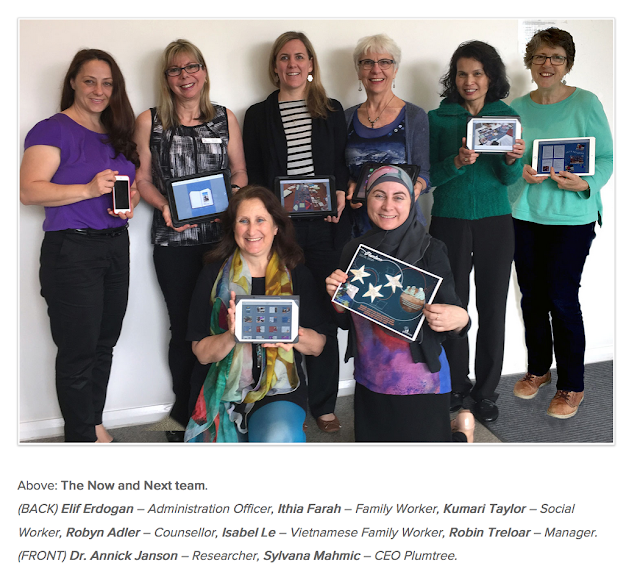 We disseminate translational knowledge gathered from 4 participating countries (Australia, New Zealand, Finland and Canada) on the application of this model for practitioners to use in their work with families and to inform commissioners and policymakers’ decisions. Moore, T., Fong, M., & Rushton, S. (2018). Evaluation: Now and Next program. Plumtree Children’s Services, Inc. & Murdoch Children’s Research Institute. Parkville, VIC: Centre for Community Child Health. Seligman, M. E., Railton, P., Baumeister, R. F., & Sripada, C. (2016). Homo Prospectus. London, UK: Oxford University Press. Setting an inspirational vision for their disabled child and family is a powerful experience that few parents have the opportunity to develop in the early years. When families do develop strong visions for their children’s future though, there is more ‘energy’ in the system to bring this vision to fruition. Dr. Janson's presentation described an Award Winning trailblazing 8-week capacity building program for families situated in Australasia and co-designed with 230 families. The families’ voyage begins with a creative mechanism through which they experience transformational vision setting through a novel game-like approach. Families report this evidence-based tool as being an enjoyable and powerful experience. Such a peer group environment provides families with the support to implement their vision by taking their goals into action. Technology plays an important role in this approach with families working on achieving their goals by documenting their children's progress via an App on their mobile devices designed to scaffold their learning experiences while building their skills and knowledge. Principles of the positive psychology framework underpin the program and resources. Participants report that they experience a growing sense of competence to assist their children through their development. They also report having formed deep connections with peer families expanding beyond the program. Family leaders are identified throughout the process and are invited to become co-facilitators upon completing a training program. The resulting evidence-based leadership pipeline provides a mechanism through which families can be involved in service design and delivery. Alumni families have self-organised into a trailblazing network to continue meeting regularly to stay motivated, positive and focused on achieving goals. Together, they deepen their skills and knowledge by sharing information and strategies with each other. At the outset of their inaugural conference, they have published the first Parent-Professional Relationships Position Statement, a landmark document that went viral in the disability community. This has the potential to be the impetus for families to shape sustainable social change for the sector. Dr. Janson's presentation was very well received with many European colleagues keen to collaborate in implementing some of this innovation. To be followed! 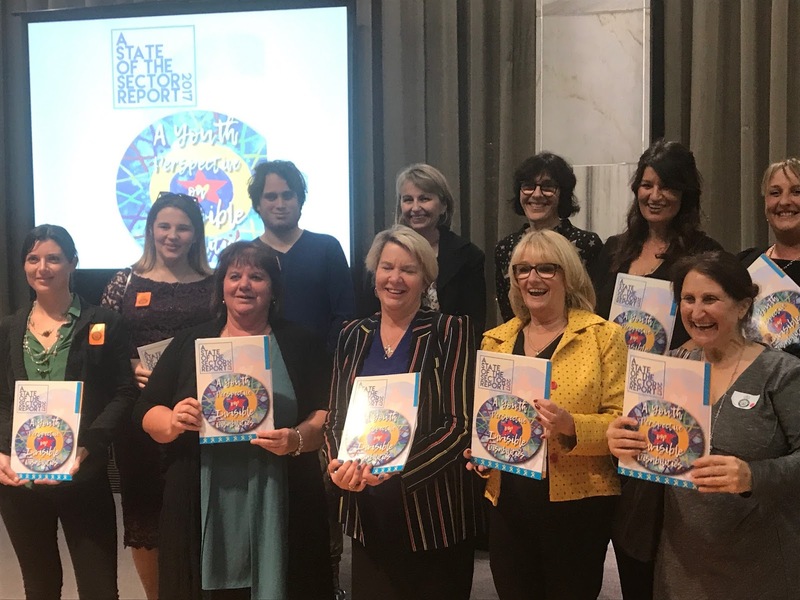 So proud to have launched our State of the Sector report at Parliament, hosted by Hon. 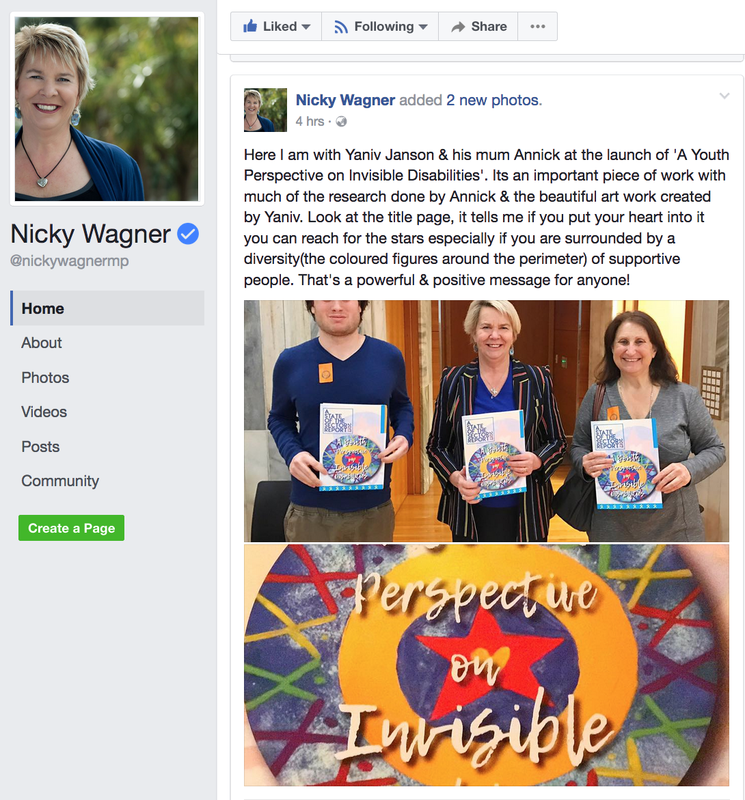 Nicky Wagner, Minister for Disability Issues. Leadership team photo below. In photo from L to R: Yaniv Janson, Hon. Nicky Wagner, Robin Janson, Annick Janson and Melissa Janson who worked together on research and design to publish the report and Helen Gempton and Trisha Benge from the McKenzie Centre, Hamilton. More photos. Download also available from ResearchGate or The Ecosynergy Group. To accompany the research findings are comments from youth with invisible disabilities and from the CUBE - the collective who has commissioned the report. We were thrilled that this report was so well received and looking forward to the next stage: filling in the gaps! Next we'll convene a research summit to find out what about the lived experiences of these families and youth that will help us provide support and leadership to increase outcomes and results for them... so this is to be continued! We have won the 2017 ECIA NSW/ACT Excellence Award for Outstanding Family Centred and Culturally Responsive Practice! The Now and Next program is a breakthrough peer network and family leadership initiative for parents of young children with disabilities or delays in their development. The programme aims to provide an opportunity for families to inform, support and motivate each other to aim high and see new opportunities for their child now and in the future. Since 2015, 190 parents have taken part in this evidence-based 8-week group programme and we are on track to reach 340 by June 2018. Now and Next is delivered by paid peer facilitators who receive training and leadership development to support their effective work with families. We also presented our progamme and method at that conference and received overwhelmingly good feedback. In disseminating stories about what people with disability and their families have learnt about creating a good life for themselves, the question of measuring impact came up. 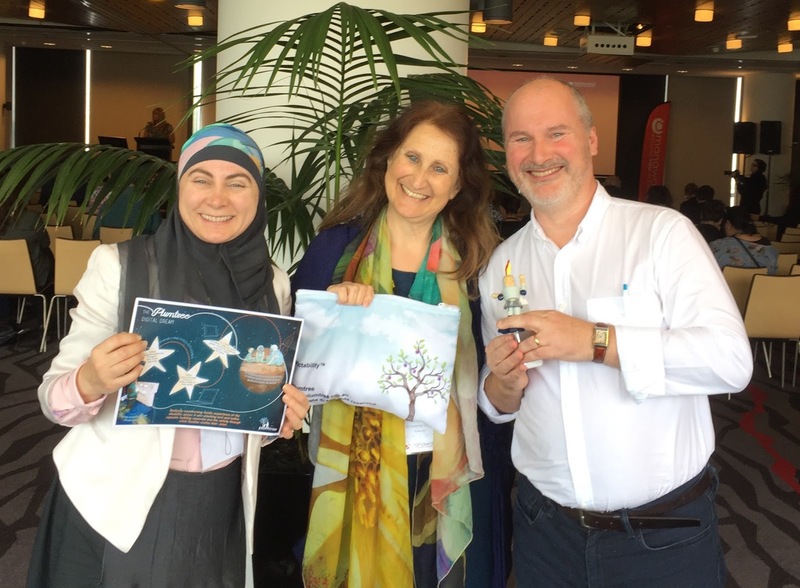 Following one of the Leadership Development program we ran in the past with New Zealand parents of children with disability, we were thrilled to see that participants raced to take their leadership to the next level. One of the outcomes of these workshops was video clips that parents produced telling the stories of how they were working to create a 'good life' for their children. These video clips were, at first, meant to share with each other in the workshops, but parents wanted to distribute their stories further into their social media... so together we followed the stories' progress through these channels. Below are screenshots of this data - showing how far have their stories have traveled. In this new accountability environment, where organisations are asked to provide evidence for the impact their activities is having, the quantitative information that analytics offers is hard to beat. Amazing buzz at the Manawanui InCharge conference!! Firstly, Michael Kendrick greeted his fan club. We had lots of fun continuing with a deep discussion about building a leadership pipeline for families raising children with disability. Michael has been incredibly supportive of our endeavour since the beginning - he is our mentor. Secondly Simon Duffy loved the ideas we co-designed with our families! Our process clears a space for families to set an inspiring vision for their child's progress and from which they plan a series of steps to achieve it. Simon experienced our Pictability tool set first hand and invited us to join the global Citizen Network (www.citizen-network.org)... more about this soon!! Thirdly, our presentation was very well received. In the photo below, we carry on talking about it after our presentation with mothers and service providers. What are our points of difference? Our vision is long term: Alumni families will continue building their understanding and practice to help their children prepare early enough for a transition out of the education system and into the world of employment and self-employment. These families will have built the experience of planning for outcomes and will guide their children on how to stretch their Individual Funding into the meaningful careers they will have chosen on the basis of the strengths they will have built since the start of their Early Childhood Intervention experience. We aim to start new conversations with professionals: The peer networks assists families through a mix of personal guidance and coaching. How to change the relationship between families and professionals with the expectation that new outcomes are sought. Families build outcome-based partnership with professionals selected on the basis of targeted needs. This will assist all families - those who prepare for NDIS as well as those who will not be eligible. Our collective work is deep and fun! We have developed a suite of tools that are as fun as they are effective to assist families create their vision and work on it, we coach families to embed their strengths into self-affirmations, we embed the mindfulness principles we use into colouring books that parents work on. We are building a social movement - and it is spreading rapidly. 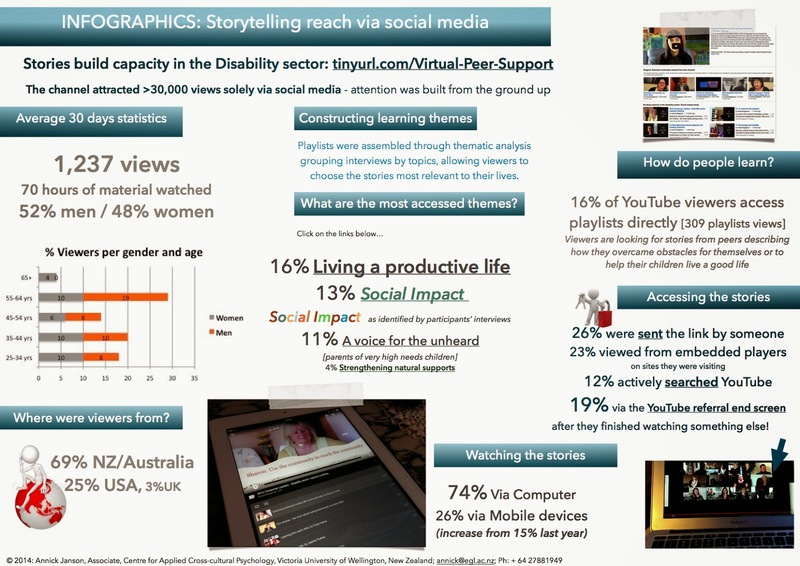 Visual storytelling - more than you expect! Visual storytelling is an amazingly powerful - yet ultra simple - method to put together stories using photos, videos and text and then share them. Visual stories are authentic and powerful stories that can connect to others in novel ways. 1. A young artist's message: "don't worry Mum - I will be fine!" What we LOVE about this visual storytelling tool is that we can use it to tell stories about short or long learning - we can use it to capture an instant in time, when we realised something about ourselves, or an ongoing process with different milestones. At EGL, we aim to build up a story space where parents can exchange stories about what they learn daily when paying attention to the (sometimes subtle) messages that their children are putting out... we think that parents will learn from each other the "art of noticing" - upon which strength-based positive psychology is based. 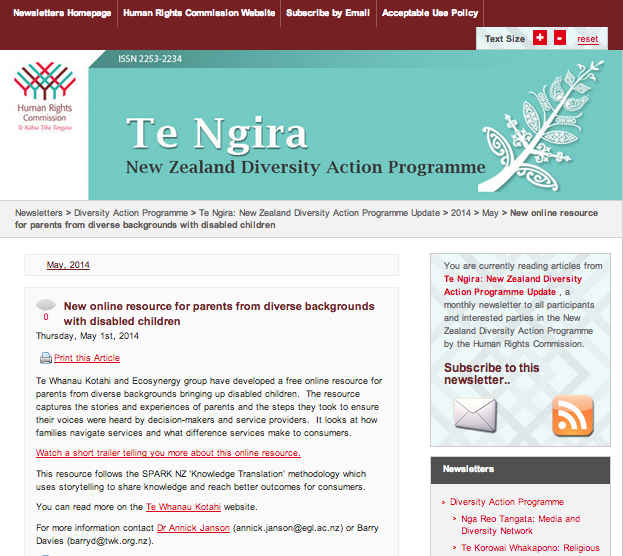 Can we provide a better experience for families to access the disability sector? Our experience piloting the Now and Next programme with Sydney-based Plumtree show that families can build resilience whilst learning to reach the goals they have set. Despite changes in the disability sector that embrace person-centered philosophy, the sector still uses the same planning process - one led by professionals who ask a series of questions to families who answers them... this process was borrowed from the business sector. However research has shown that families told about their child's disabilities are under significant stress and "cognitive" planning in these circumstances is hard. We have piloted a fresh process designed to enhance families' visioning. Family's creative brainstorming encourages them to formulate dreams and goals for their child, their families and themselves. Families work on achieving their goals by documenting their children's progress as well as their own learning via an App designed to maximise parents' learning experiences. They reported feeling more in control, building agency about helping their child, enjoying being more involved in their child's progress... our research is in progress and we'll update this blog as we go. Thank you Plumtree Now and Next team!!! A unique short-term Navigation™ Service Coordination initiated by NorthAble assists disabled people and their families and whänau to overcome specific obstacles and reach meaningful outcomes. Annick Janson's presentation summarised the organisational learning assembled through partnerships between a service provider and disabled families, and identified the factors setting it apart from other related interventions. Fourty five families described the impact of Navigation™ on their disabled family member and the family’s resulting connection to natural and community support systems. A combination of qualitative (narrative/thematic) and quantitative (social media) analyses uncovered a four-quadrant model of organisational capacity building. A complex interplay of factors influence such sustainable outcomes: staff, decision-making patterns, outcome parameters and staff-clients interaction processes. Each factor involves multi-layered activities such as Procedure Manuals, IT systems recording timelines and organisational milestones and outcomes. Describing these active elements informs general navigation processes, early warnings and potential risk factors that could compromise outcomes - depending what elements are missing from interventions. Results were embedded into organisational procedures through a series of innovative and comprehensive self-paced online workforce training modules. Hence tacit knowledge collected from a decade of leadership building, staff monitoring and clients’ experiences shapes the developments that ENCompass Navigation Services take into the future. The launch of the Plumtree Family StorySharing project was a huge success. Below is the welcome of Hon. John Ajaka, NSW Minister for Disability Services and some photos of the event. The official photo with the stars of the show - families who shared their stories. 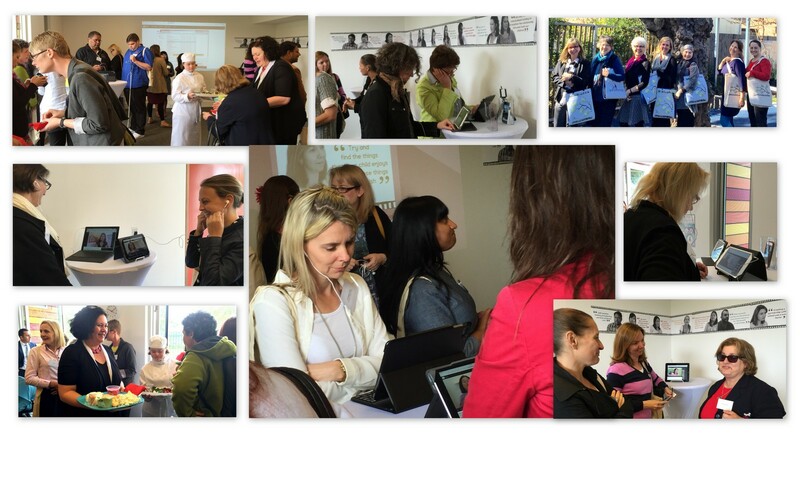 Collage with some events photos - joyful sharing and also intent listening of the stories. Video clips of the stories were screened via phones and tablets to recognise the growing trend of our audience accessing our materials through mobile devices. So proud to present the culmination of one project - and the beginning of another one. The below is the trailer for the launch to be inaugurated by Hon. John Ojaka, Minister of Disability NSW, Australia. 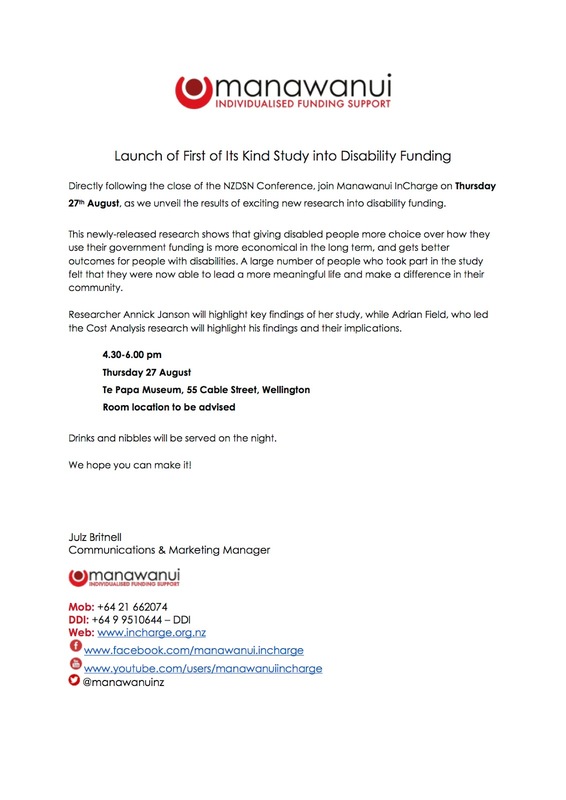 Stories that Build Leadership in the Disability Sector: Launching our Research Report! Launching our research in Te Papa!! Annick Janson's research report can be downloaded on the Manawanui website. 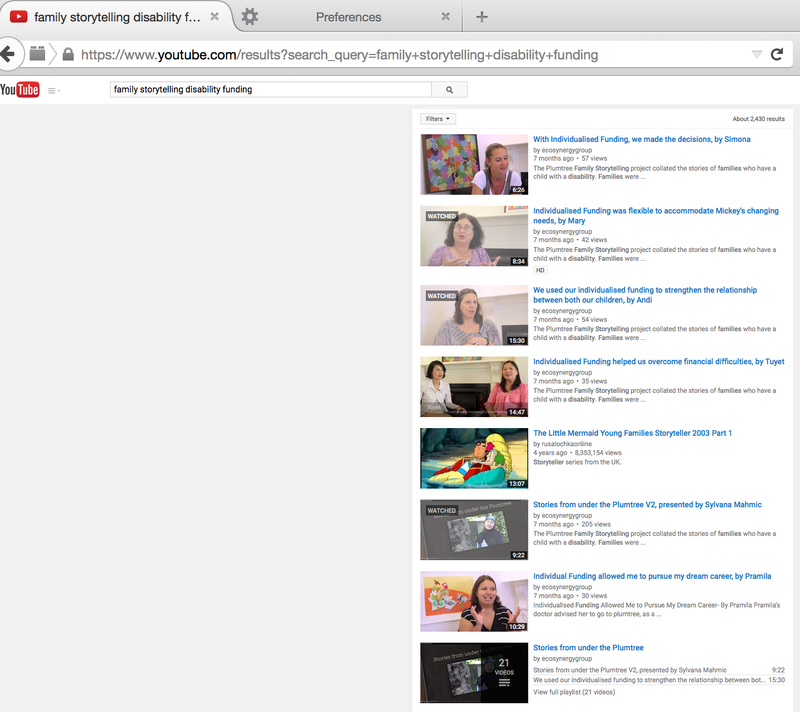 Searching cyberspace for stories about how parents with disabled children use individual funding to help their children achieve developmental milestones, we were floored to see that 7 out of the first 8 results returned by YouTube for these search words were from our Plumtree Story-sharing project! [25 July 2015]... we are on page 1 !!!! Welcome news - Professor Richard Bedford President of the Royal Society of NZ!! 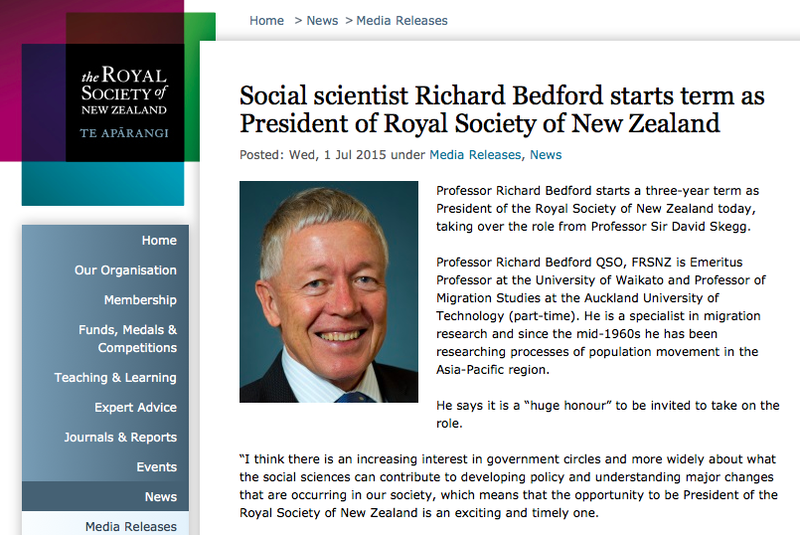 Welcome as the first Social Sciences scholar, Richard!!! This is great news for the Royal Society!! We start 2015 hitting the road running... our YouTube Story-sharing channel viewership has exceeded 35,000 over the New Year period. Access it at tinyurl.com/Virtual-Peer-Support or from the left column list on this website. One statistic to note: over the past 30 days alone we registered >1700 views... another hint that our audience is watching us. Together with the readership of our Fast Track Inclusion Trust (~13,000) and our various other Social Media channels, we are approaching coverage of 100,000. Joanne: I think it all began with individualized funding, Its been made possible. We’ve been using individualized funding for over seven years and gradually we have built up the confidence in networks and we’ve had (time to plan), time to dream. – Which I think it’s probably one of the big issues with family with children with young…. People that get so overwhelmed. Lawrence: For those who are out there… in similar cases like my family or starting their journey… I think there are a lot of potential and opportunities to look at. Do just (you know) give up in respect to time. The Plumtree Family Storytelling project took place in Sydney in October. It collated the stories of families who have a child with a disability. Families were interviewed and coached to tell their stories on video. The interviews focused on the process they went through to receive individual funding, the use they make of it to assist their family in for instance purchasing resources or services, the impact that the funding had on their child and by extension on the whole family. Looking forward to our February 2015 next working session! The families reflected on their experience with caring for a disabled child, from the time they received the diagnosis, through to making contact with Plumtree and commented on the lessons learned along the way. These lessons were analysed thematically and the interviews were post-processed so that these lessons be easily shared with other parents. A trailer introduces the project and provides the context relevant to Plumtree present and future audience. In total, just over an hour of video materials were produced. 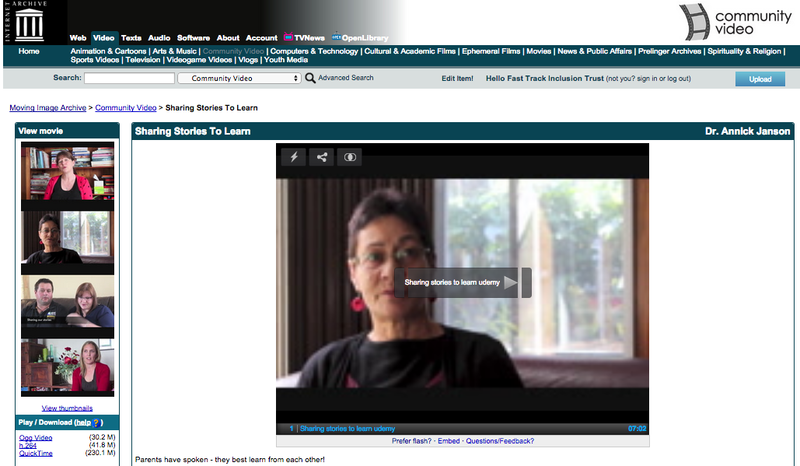 The Storytelling project provides unique learning materials for other professionals. The potential to develop relevant and appealing staff training programmes from parents’ stories is great, as families reflect on their reactions to the services provided by Plumtree. Additionally, these parents’ experiences with the system can offer valuable insight for NDIS policy and implementation. 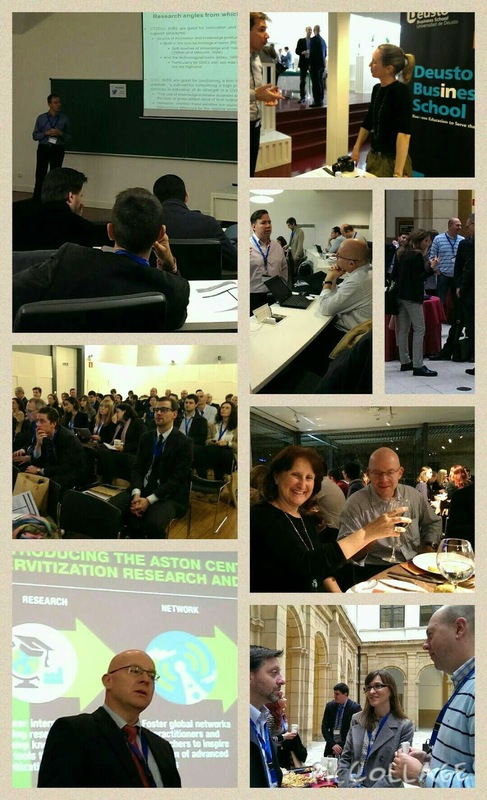 Great discussions in Bilbao, Spain! Exploring new servitization concepts to support future success and novel operation models (www.servitization.org). Great discussions with Tim Baines (www.aston-servitization.com) on the role of storytelling methodologies to help SMEs understand the novel opportunities offered by servitization models! I am interested in how Collaborative Economy intersects with these new models and what the contribution of storytelling can be. This comes as the follow up on the research presented earlier this year. More details here. Steve Denning, the Leadership guru enjoyed this cool talk by an Australian, Rachel Botsman, about collaborative consumption as a powerful economic force, reinventing both what we consume and how we consume. Her main point is that in the 20th Century, we became fixated on owning things, when what we really want is not the thing, but the experience that the thing generates. Once we have made this insight, life becomes a lot simpler and cheaper. 1. There are some collaborative sharing platforms where people offer objects they want to get rid of or volunteer a service and receive many offers for them... in such a case, interested buyers introduce themselves and share some information about them with the 'sellers'... how do 'sellers' then make a choice as to who they give these objects/services to? Our question: how do supply and demand work in a world where the rules of engagement have changed and stories can make a difference in whether you win the object/service you want? 2. There are some collaborative platforms where what is traded are... stories. Families caring for disabled people share stories of how they have overcome obstacles to create a better life for the disabled family member. People share their story on the platform and thereafter listen to the stories that their peers have also shared. The viewership of the tinyurl.com/Virtual-Peer-Support Youtube channel grew to over 30,000 with no planned promotion - only people spontaneously sharing URLs of stories via social media. Our recent knowledge-sharing work is about supporting disabled people to dream up and create their own business - shaped around their passion and talent. We have seen great examples of disabled people capitalising on their strengths to gain or create meaningful employment for themselves. Encouraging this fulfils our social innovation vision. We carry out targeted learning projects that are directly applicable to enriching the everyday life quality of families living with disabilities. Since it is proven that peer-learning is the most effective way to learn, we systematically track and disseminate successes already achieved so that others can readily adapt them to their circumstances. There are many instances where families could and should help themselves by tapping into collective wisdom. This frees disability services capacity to assist their clients more efficiently. Mainstream workplace options are rarely available options to people with communication or social disabilities. This is our signal to provide this group with knowledge on how to create self-employment and enter the business world in a way that allows them to contribute whilst showcasing their talent. Supporting the promotion of activated research and knowledge (SPARK) is a training workshop developed by the Mental Health Commission of Canada (MHCC), which teaches techniques for moving evidence-informed mental health and addictions research into practice. 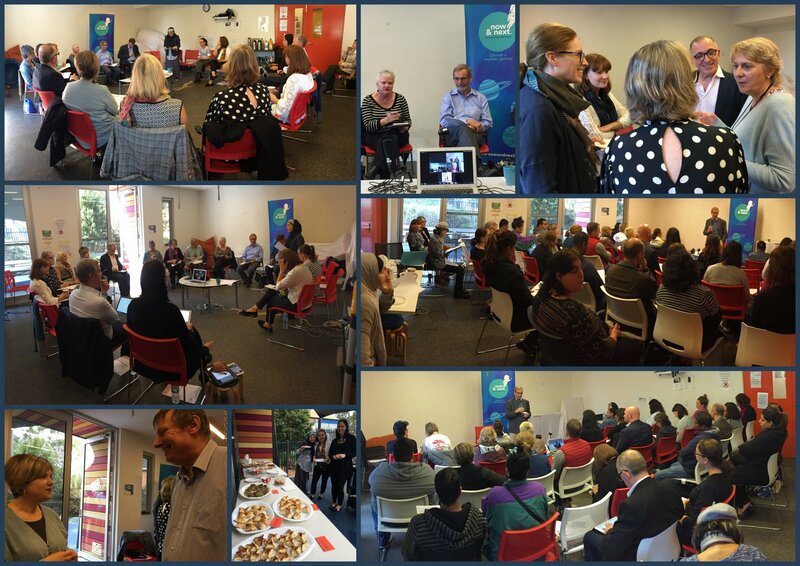 In 2013 Te Pou partnered with MHCC to deliver a SPARK NZ workshop in New Zealand. A new video highlights what SPARK NZ is about and how the training supported three participants to implement innovations in their organisations. View the video on our website or on YouTube. Annick developed a methodology to capture on video stories shared by parents of disabled children during a leadership development programme. The project tested a participative evaluation process to represent the diversity of consumer voices. 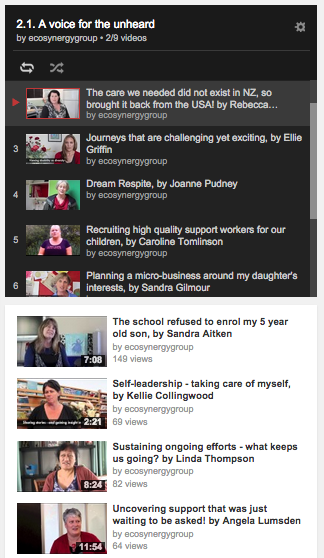 These stories have now been shared with families, consumers, planners and funders. 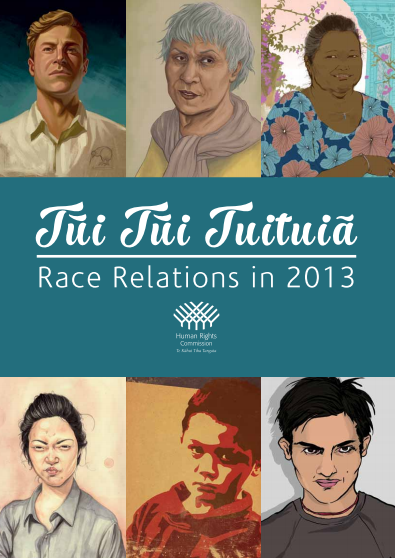 Read more about the project on the Te Whanau Kotahi website or watch a short trailer on the videos. Check out a recent presentation of the work. 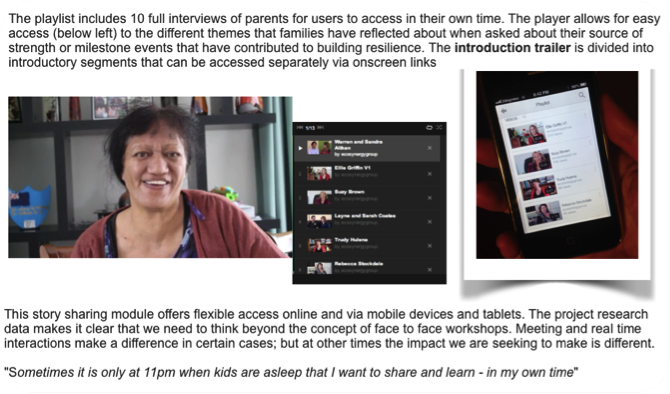 The results of our Family Consumer Leadership Development work is available through the Te Whanau Kotahi website at: www.twk.org.nz/changestories See the Abstract describing the intervention below. Test a participative story selection and evaluation methodology mechanism to represent and honour the diversity of consumer voices. Te Whanau Kotahi Trust, which provides child development services in the Western Bay of Plenty under MOH contract commissioned the project. They were keen to understand family/whanau perspective of services offered and what advice could be widely shared from families personal experience.The consumer storytelling project was seen as closely aligned to the Te Whanau Kotahi vision: "Children and families/whanau are valued and included in the social and economic fabric of our communities". Thirty telephone interviews, 3 workshops and 10 individual video recording sessions were carried out. The study outlined a continuum of leadership experiences working at four levels (self, family, peers and sector) that characterized their practice in advocating for their special needs children. In their leadership development path, it became clear to them that they need to take action to reach key decision makers, service planners and service providers in the sector – where parents’ voice needs to be heard. Participants selected themes to be integrated into a combined Significant Story Trailer to represent their experience and planned a dissemination pathway, including the use and monitoring of Social Media channels. 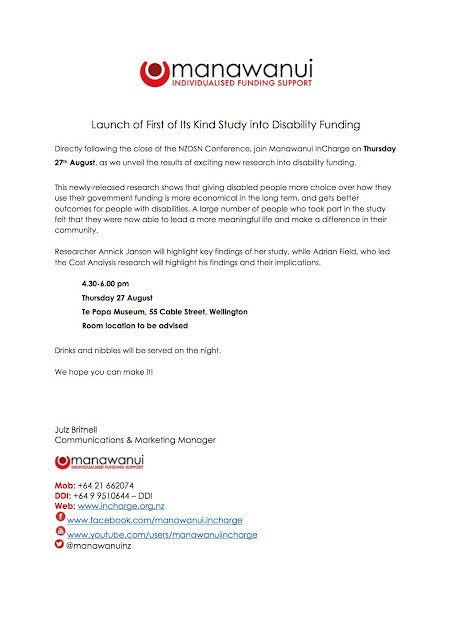 The trailer introduces the project (see: http://tinyurl.com/TWKinterviews) for their voice to be widely shared with the disability sector. 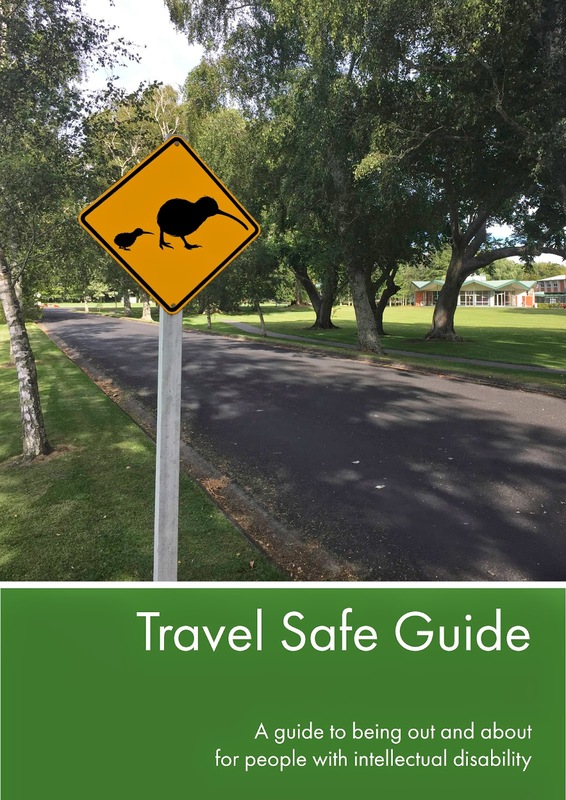 Download the Parents' Guide here. The findings contribute robust evidence for service delivery and policy development in the Health and Disability sector – where quantitative measures are traditionally preferred. This project followed the SPARK NZ ‘Knowledge Translation’ methodology and was supported by a Consumer Leadership Development Grant administered by Te Pou.